I've just returned from a few days in the bush. Five days without internet access was a real break. I got to read a few books and eat way too much. 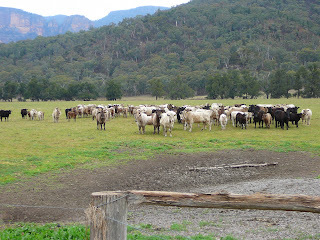 There're lots of cows in this part of the bush. Cows are funny animals. They're curious and also skittish, and they can make a lot of noise. The Australian bush is also full of poo - rabbit, wombat, kangaroo, sheep. We had a young dog in our group and every time we took her out for a walk she'd go straight for the poo and gobble it up like chocolate - eewww! I did not know this about dogs!